west coast of Barbados, 3 miles from the historic town, Speightstown. experience the refreshing cool tropical breeze which filters through the villa - an unforgettable peaceful and relaxing atmosphere. The six bedroom suites all have en suite bathrooms, robes, portable hair dryers, air-condition units, ceiling fans and views of the Caribbean Sea. The popular master bedroom 'AWAFIA' suite has a king size bed, walk in closet, his and hers vanity,its own private balcony overlooking the Caribbean Sea as well as a plasma television. The 'PLANTATION SUITE', boasts a delicately decorated four poster queen size bed with its comfortable rocking chair tucked away in the corner. The other four bedroom suites each have separate, special unique Caribbean features. Each contains two double beds which, if desired, can be easily converted to a king size bed. The living area with its Berbice chair and its French doors opening onto the patio, is ideal for open-air relaxation. This is also a popular area for sunset cocktails. Watch the cruise liners entering and leaving the port as they travel along the horizon. For those who enjoy relaxation in a garden setting with breathtaking coastal views, the gazebo is ideal. You can also spend some quiet moments tucked away in the cool, relaxing library. Dining may be in the main dining room which seats twelve persons and opens onto the pool and gardens, or in our more intimate dining area upstairs, or outdoors in the gazebo with its barbecue station (a joy especially on a moonlight night). swimming and snorkeling or just sunbathing. for weddings, anniversaries, getaways and retreats - couples and honeymooners included. JET BLUE - daily from New York and Fort Lauderdale. Medical practitioners educated at University of the West Indies, Mona and Edinburgh University. Hobbies golfing and tennis. We do live in Barbados. 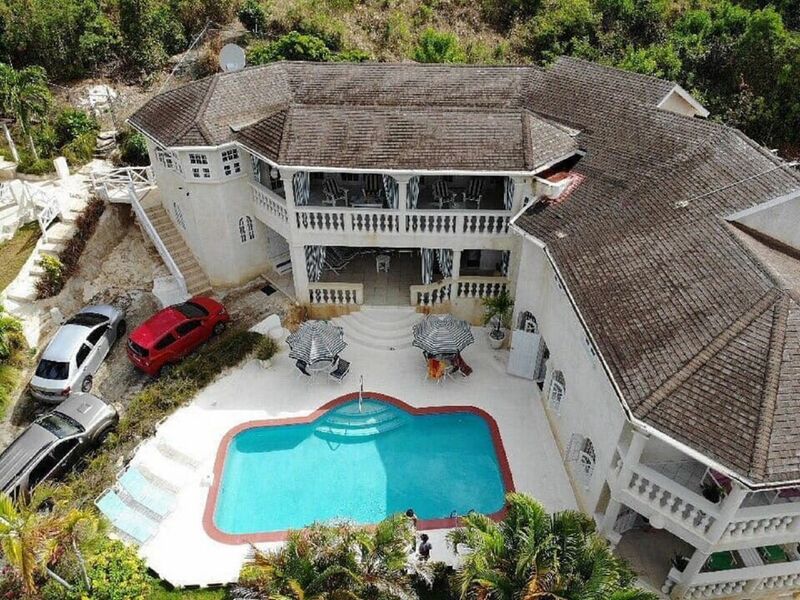 The owners took great care in choosing the perfect location for the villa - a quaint area on the north-west coast of the island so as to experience the Caribbean Sea, but also to experience the quiet relaxed Barbadian life. The proximity to the beach and the rhythmic sounds of the ocean led them to choose the name ‘Sea Symphony’ strongly influenced by their renowned musical background. The excitement of activity is a stone’s throw away and with numerous choices including golfing, water sports, fine dining, shopping and a variety of attractions in Speightstown and Holetown. For the more adventurous, the East coast is also nearby for those who want to experience the rugged terrain and the Atlantic Ocean, which is good for surfing and is a regular stop for international surfing. Just relaxation - daily staff of chef, housekeeper, laundress and pool attendant . All bathrooms are en suite with'comfort' robes, toiletries, portable hairdryers and bath linens. The villa is just 30 metres from the ocean. The villa is 30 metres from the beach. There is a paved pathway from the villa to the beach. The washing machine is exclusive to the villa. The clothes dryer is exclusive to the villa. WiFi is high speed and complimentary. Bring your laptop. The villa has two refrigerators - with both an ice maker and a water dispenser. Basic spices and seasonings are provided. Special spices and seasonings can be requested. Cutlery, crockery and kitchen utensils are provided. You have a choice of three dining areas - an intimate area upstairs, downstairs in the main dining room or outdoors in the gazebo. There are two portable stereos. Some beach and pool toys are available. The gardens have a variety of tropical plants including local ginger lilies and heliconias. The Awafia suite has its private balcony and a spectacular view to the beach. The living room balcony is a popular area to relax and capture the view and sunsets. The pool has open and covered decks. The view from the living room patio is spectacular. We provide a few small surf boards and sand toys. Other water sports gear can be obtained from the nearby water sports company. Tennis can be played at a nearby hotel for a fee. Sandy Lane and Barbados Golf Club are interesting courses. The villa has a private outdoor pool. The pool is usable all year round.